For this weeks Bloggers Challenge - our theme was Inspired By. Who or what inspires you to create? For this challenge I went with the WHO inspired me..I was inspired by Sheryl who posted a link to this tutorial for a gift card holder. I decided to alter the dimensions from the tutorial to suit my needs, because I wanted my gift card to fit into SU's Mini Envelopes. Here's an open view - as you can tell by looking at my open view - I also eliminated some of the card stock from the original tutorial, thus getting rid of that center pocket. 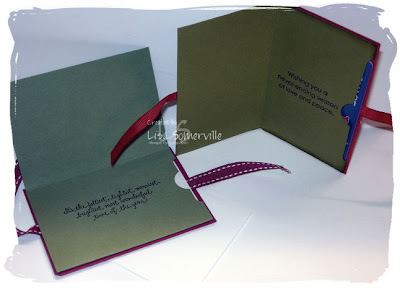 Here's a tip for making your Red Grosgrain match your Ruby Red card stock, using your sponge dauber and Sahara Sand Ink, gently sponge the ink onto your Red Grosgrain, then let dry. Don't forget the Build-a-Brad is now available - contact me today to order this must have embellishment! 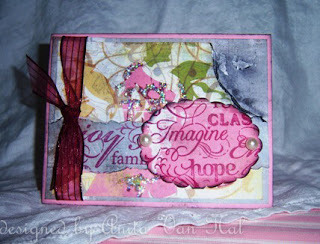 Anita Van Hal is back with me as my guest challenge player - here's her beautiful card and inspiration piece. Be sure to check out the Blog Challenge Players links on my sidebar and see what inspired them this week! those cards are too neat. I love the idea of the gift card holder. Super cute. I always need gift card holders. I love what you did with yours. Great gift card holders--love your take on them. Can't wait to get my Build a Brads! WOW! Now I need to do these! I forget about little gift card holders sometimes. They are the PERFECT gift! What a great project Lisa! I hadn't seen Sheryl's gift card tutorial. I love your modifications. These would be great at Christmas or for Birthdays. Cool gift card holder and I love your inspiration intrepretation! I always am in need of them. Fantastic!!! 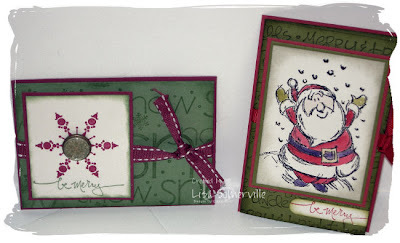 I saw those on Sheryl's blog and love what you did with it! Both holders are beautiful! Also, please share with Anita that her inspiration card is great, too! Very cute gift card holders. Anita's card is fantastic as well! Fun Gift card holders. 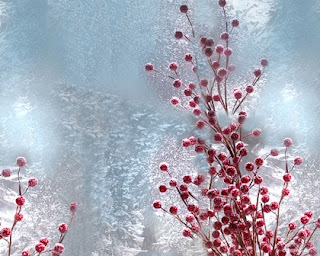 The snowflake one is so pretty & I love the bauble in the center. That Santa image is also just so cute. - Your guest stampers card is really lovely. I'm so jealous you have your build-a-brads already! I just ordered mine and can't wait to play! Love your gift card holders! Thanks for the link to the tutorial. I'll be giving it a try for sure! I love your gift card holders! TFS! These are great--just perfect for the holidays. I'll have to check out the tutorial. Thanks for sharing the tip about the ribbon. Perfect gift card holder!!! I love Anita's inspiration piece. Wonderful projects!! Love the brad! !